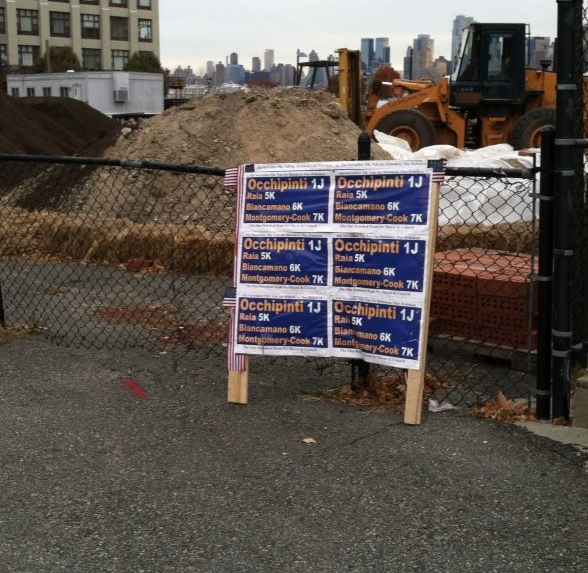 The waste of campaigns is gone but there is one campaign laid waste by Hoboken voters still kicking around. Reports of the Raia-Mason slate campaign garbage are coming in around town and people are beginning to complain why they don't remove the eyesore. One person wrote saying to Timmy on Facebook, "How about you throw out your garbage?" An illegal sign placed on 14th Street for Timmy Occhipinti is still there. Hey, fire up that bulldozer! MSV has heard other similar complaints from the fourth ward saying, "It's a mess down here with (their) Timmy garbage." MSV is calling for emergency action of the Hoboken Volunteers to get out Sunday afternoon at 1:00 PM and clean up the mess Timmy made. Hoboken Volunteers, let's clean up Hoboken after your leader! Talking Ed Note: Without overstating the matter, this is a reflection of the lack of respect for Hoboken. We've seen the actions of these benevolent humanitarians and this is consistent with Timmy himself. MSV would note although days back the campaigns manager Jamie Cryan extended congratulations to Mayor Zimmer on his Facebook page, Timmy Occhipinti nor his underwriters Frank "Pupie" Raia or Beth Mason made any similar public statement at all. (Mason to her credit did issue congrats to the mayor and council members by name on her Facebook page.) At the council meeting Timmy instead made a generic congrats to "all the victors." Well the rent control folks will be happy to know that. What does that tell you about their character? More campaign crap: Timmy Occhipinti stickers illegally posted on City property are all over too. Where are Timmy's Hoboken Volunteers? Or the Beth Mason Masonistas to clean up their poo?